Background: The p38 MAPK (mitogen-activated protein kinase) pathway contains protein kinases which engage in respond to various extracellular stimuli an intracellular signalling cascade, coordinating the activation of gene transcription, protein synthesis, cell cycle machinery, cell death, and differentiation. The different p38 MAPK family members (p38α, p38β, p38γ, p38δ) encoded by different genes show an approximately 60% identical in their amino acid sequence but have different tissue expression patterns. p38 MAPKs being activated by dual phosphorylation of the Thr-Gly-Tyr in the activation loop sequence by MKKs/MAP2Ks (MKK6 and MKK3). Down-regulation of p38 MAPK is achieved for instance by Wip1, a phosphatase of the PP2C family that can be transcriptionally up-regulated by p53 or by MKPs, a family of dual-specificity protein phosphatases. Upon activation p38 MAP kinases can phosphorylate substrates on Ser-Pro or Thr-Pro motifs on MSK1 and 2, which directly phosphorylate the transcription factors CREB, ATF1, or cytosolic proteins such as phospholipase A2, Bcl-2 family proteins and cyclins. Because of the important role of p38α in inflammatory diseases it is also an interesting pharmaceutical target. 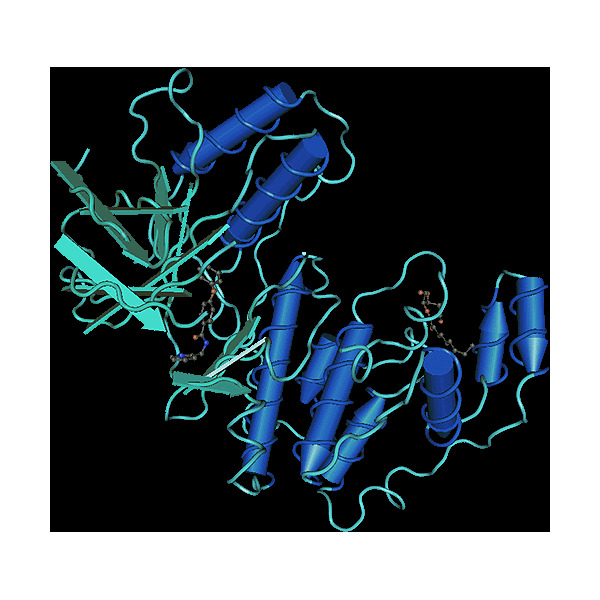 Based on SB203580, one of the first discovered p38α inhibitors structurally diverse p38α and p38β inhibitors have been developed with both enhanced potency and specificity. Figure: Real-time kinetic analysis of kinase inhibitor SB203580 binding to p38β using surface plasmon resonance.